Paul Krugman has argued that Greek voters should vote to leave the euro. He is right. His argument is macroeconomic: Continued austerity will drive Greece further into the ground whereas exiting the euro, while creating financial turmoil in the short run, would allow Greece to devalue, restore competitiveness, and thereby return to growth. This is a good argument. This is precisely how countries have dug themselves out of the hole since the Gold Standard gave up the ghost. But I believe that there is an even more compelling reason for the Greeks to vote no in the referendum on Sunday. We have been told that this is the Greeks’ own fault; that they are a lazy and profligate people who borrowed too much money and don’t want to pay their debts. There is only one problem with this Swabian housewife morality tale: It is absolute poppycock. First of all, there are structural reasons for systematic differences in debt-to-GDP ratios between nations. For instance, Japan’s debt-to-GDP has ballooned steadily from 80% in 1993 to 186% in 2005 as a result of the combination of a secular slowdown in growth and a rapid aging of the populace. 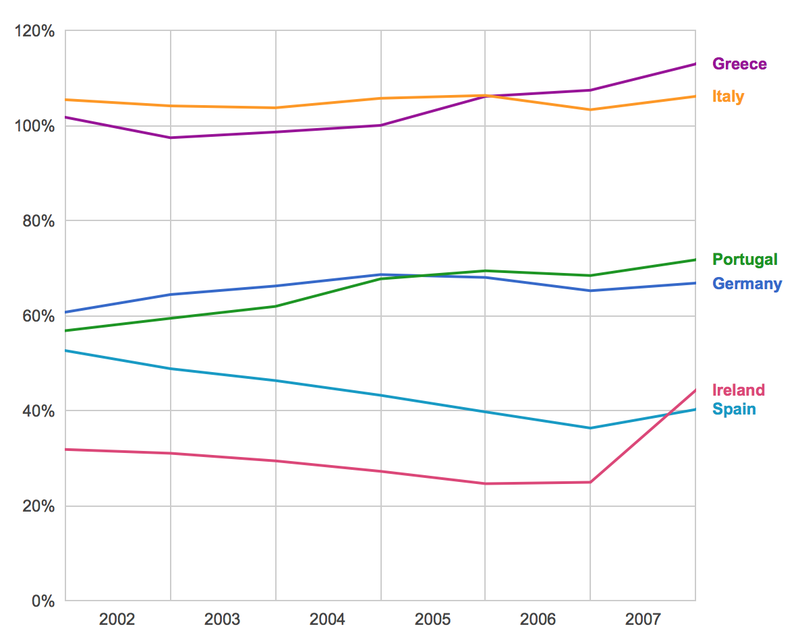 In any case, public debt in Greece was not much out of line with other sovereigns. Prior to the Western financial crisis, Greek government debt was around 100% of GDP; close to present-day US levels and below the average level prevailing in the UK over the course of the past three centuries. In 2006, before the onset of the banking and financial crises, Greece’s debt-to-GDP ratio was identical to Italy’s. What, then, accounts for the very different fates of the two nations in the decade since? More generally, if you compared the government debt-to-GDP ratios for Germany and the peripheral European national economies, the so-called P.I.I.G.S. (Portugal, Italy, Ireland, Greece, and Spain), before the Western financial crisis, you may be surprised to find that the Spanish and the Irish were Swabian housewives compared to the profligate Germans. No one could’ve seen this chart [Credit: Google] and predicted that Portugal, Ireland, and Spain would face mounting debt crises, while Germany would lecture them on fiscal discipline. The whole idea that the crisis was the result of fiscal profligacy is, I repeat, poppycock. The truth is that the crisis in the eurozone had little to do with fiscal deficits and a lot to do with current account deficits. 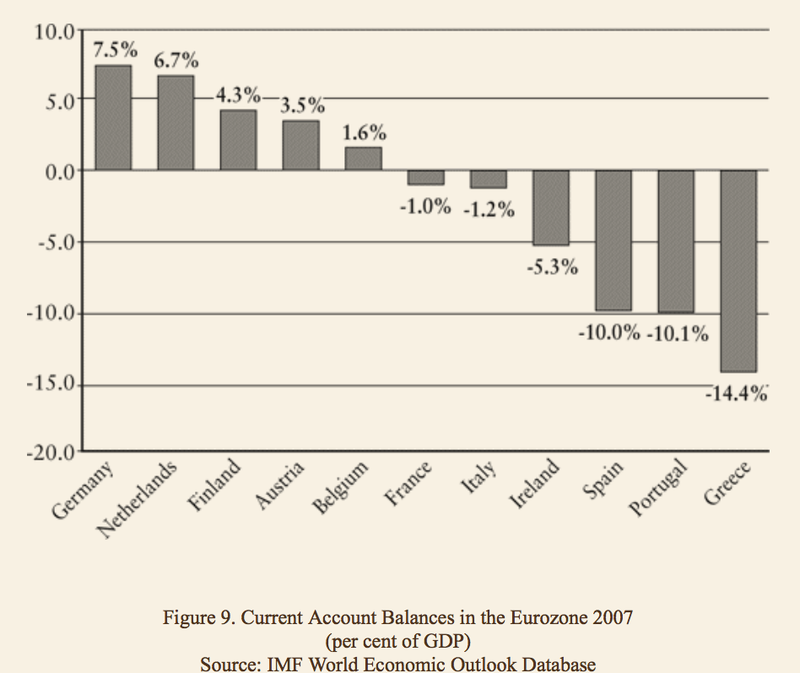 The root of the crisis lay in the balance of payments inside the eurozone. It is on that chart [Credit: Martin Wolf] that we find the systematic difference between the core and the periphery of Europe. 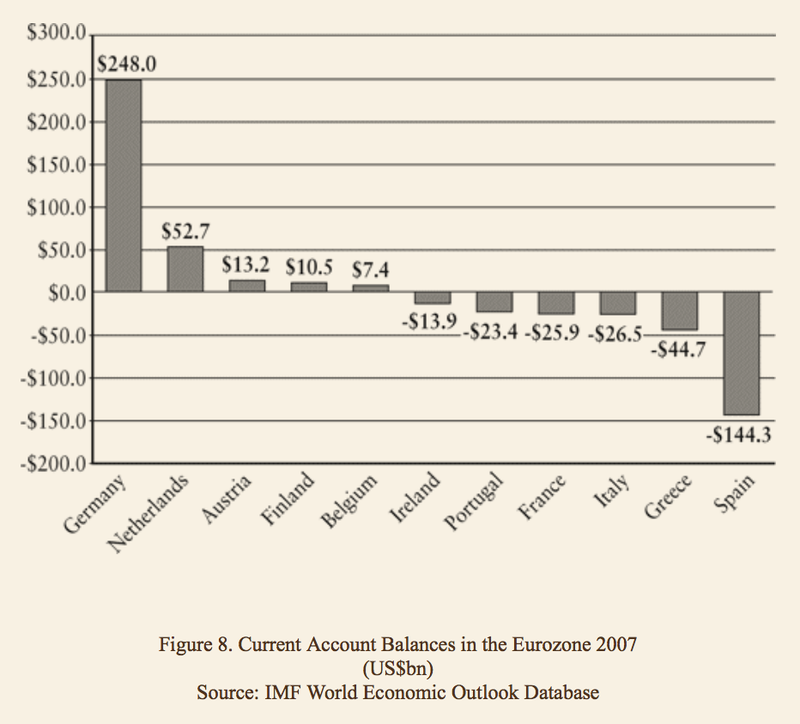 Germany was running an annual surplus to the tune of $250 billion which was necessarily off-set by dramatic current account deficits on the periphery: Due to the monetary union, the international balance of payments have to add up to zero at the level of the eurozone. You can also view this as a loss of competitiveness in the periphery: unit labor costs rose dramatically against Germany. But I think that the right way to view this is through the capital account: The monetary unification of the eurozone allowed the high-savings countries of the north, most dramatically Germany, to export capital to the European periphery at an unprecedented scale. Market participants believed, mistakenly as it turned out, that sovereign defaults in the eurozone were effectively impossible. As a result, sovereign credit spreads got impossibly compressed. Bondholders required almost no additional compensation for holding Greek over German government bonds. This was, of course, not the only risk that market participants were mispricing in 2004-2007. When the Western financial crisis forced market participants to reprice risk globally, the first response of private investors was to flee to safety. The banking crisis soon became nationalized as the global financial institutions became wards of their respective nation-states. As the sovereigns’ ability to pay became increasingly questionable, the financial crisis morphed into a sovereign debt crisis pitting the capital exporting countries in the north against the capital importing countries of the south. Instead of being punished for their own faulty judgement, bondholders turned to international institutions to negotiate on their behalf. We shall return to the bondholders’ mobilization presently. IMF bailouts of bankrupt sovereigns have usually been accompanied by structural adjustment measures. The results of these draconian austerity measures are not under much dispute. To mention just two serious studies, Prezewoski and Vreeland (2000) found that “Program participation lowers growth rates for as long as countries remain under a program. Once countries leave the program, they grow faster than if they had remained, but not faster than they would have without participation.” Dreher (2006) also found that IMF-imposed structural adjustment measures unambiguously “reduce growth rates”. But the austerity imposed on Greece, and to a lesser extent, other peripheral sovereigns, was considerably worse than IMF-style structural adjustment for a very simple reason. IMF-led structural adjustment is usually accompanied by a currency devaluation that allows national economies to regain their competitiveness. For the adjustment to take place sans a devaluation, national unit labor costs would have to fall in nominal terms with dramatic consequences for the populace. How dramatic? The unemployment rate in Greece rose to an astounding 28 percent in 2014. And between 2008 and 2013, Greek GDP fell from $355 billion to $242 billion, a fall of 32 per cent. In other words, the attendant economic devastation in Greece has been worse than that experienced by the United States during the Great Depression: US GDP fell by no more than 30 per cent and peak unemployment was around 20 per cent. But the comparison is misleading. The Greek catastrophe was an entirely predictable result of the policies imposed from without. Indeed, to find a counterpart to the draconian adjustment imposed on Greece et al. we need to go back to the nineteenth century. In that more honest time, the preferred method of getting sovereigns to pay their obligations was to dispatch a naval squadron. When politicians in Westminster created a furor over Palmerston’s decision to send gunboats to Greece in the infamous Don Pacifico Affair in 1850, Palmerston recalled 33 instances where the Royal Navy had been dispatched to secure the interests of British bondholders between 1830-1850. In 1868, British bondholders formed the Corporation of Foreign Bondholders (CFB) to secure their interests against recalcitrant sovereigns by a number of means including, and especially, lobbying Westminster to exercise gunship diplomacy. European powers went considerably beyond dispatching naval squadrons and imposing trade embargoes. Many times they simply took over the running of the government’s finances (Turkey 1881, Egypt 1883, Greece 1898). Venezuela was bombarded by German gunships in 1902 acting to secure repayment of debts, agitating US President Theodore Roosevelt to proclaim what is now known as the Roosevelt Corollary to the Monroe Doctrine: Since the United States would not allow European powers to interfere in the Western Hemisphere, it “cannot ignore the duty” to compel sovereigns in the region to pay their debts to international bondholders. In subsequent decades, the United States landed marines dozens of times in Central America to enforce the Corollary; an intervention spree that peaked under the arch-idealist Woodrow Wilson. The present-day counterpart of the Corporation of Foreign Bondholders is the Institute of International Finance (IIF), which was the principal negotiating partner on behalf of Greece’s creditors. The IIF is a front for the New York-based hedge funds who hold Greek debt. It is in their private interest that the “troika” has been strong-arming Greece. Now a reasonable creditor could be expected to take a haircut in the interest of securing certain repayment; particularly in light of the fact that unless Greece returns to growth, it will not be able to pay back much at all. However, much more is at stake. For if Greece gets a significant haircut, the other nations undergoing structural-adjustment would demand one too. This is explanation for the hardline taken by Brussels that prompted Tsipras to appeal directly to the Greek people. The European Union consists of two grand bargains. First, the EU is the world’s first security community: The rule of force has been banished to the frontier. This is an artifact of the American pacifier. Whether or not it survives will become clear only once the US presence is withdrawn from Europe. Second, and more importantly, the EU is the world’s first international democracy. It is more than a coalition of democracies: European nations have to learn how to reconcile democratic outcomes within nations in the community. The second grand bargain of the European experiment has been undermined to a great extent since the onset of the Western financial crises. The issue goes beyond that of the “democratic deficit” at the level of the European Union. The issue at stake is whether nations have the right to resist financial hegemony; whether they may mobilize democratically to secure their economic well-being; or whether they must submit to the private interests of sophisticated bondholders who do not know how to price risk. Tsipras’ decision to call a referendum was a stroke of genius. By calling a referendum, he has placed front and center the real issue at stake in this dastardly affair: Europe must choose between democracy and financial hegemony.